Diabetes is the leading cause of blindness in the world. Poor control of blood glucose levels (glycemia) for several years can cause damage to the retina and lead to “Diabetic Retinopathy”. It is very important to control your blood sugar levels properly and do everything you can to take care of your eyesight, which is the most precious sense we have. The eye is essentially a hollow sphere with a transparent front known as the cornea. The rest is made of a tissue called Sclera, usually known as “the white of the eye”. Directly behind the cornea is the anterior chamber, filled with a fluid that nourishes the eye called Aqueous Humor. The colored part of the eye is the iris, which is a ring of muscles that form the other part of the anterior chamber. The small dot in the middle of the iris is the pupil, an opening that allows light to enter the eye. The iris helps us focus and regulates the opening of the pupil depending on the amount of light required by the eye at any given time. For example: in a dark environment, the pupil opens to allow more light to enter, and thus make it possible for us to see well even in dark environments. 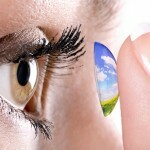 Behind the iris lies the lens, a transparent lens that focuses images on the retina. The retina is on the back of the eye. These images are then transmitted to the brain through the optic nerve, where they are recognized and interpreted. 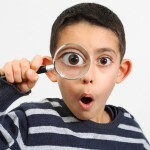 The brain also ensures that both eyes work simultaneously to perceive depth. 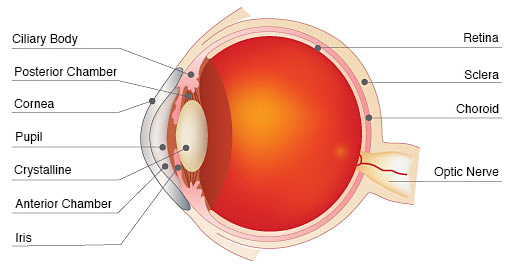 The area of the eye that lies between the lens and the retina is filled with a gelatinous substance called vitreous.